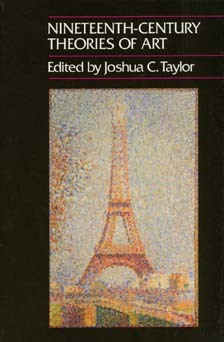 This unique and extraordinarily rich collection of writings offers a thematic approach to understanding the various theories of art that illumined the direction of nineteenth-century artists as diverse as Tommaso Minardi and Georges Seurat. It is significant that during the nineteenth century most artists felt compelled to found their artistic practice on a consciously established premise. Joshua C. Taylor was Professor of Art History at the University of Chicago and Director of the National Museum of American Art from 1970 until his death in 1981. James L. Yarnall, formerly of the National Museum of American Art, prepared and edited the manuscript for publication.